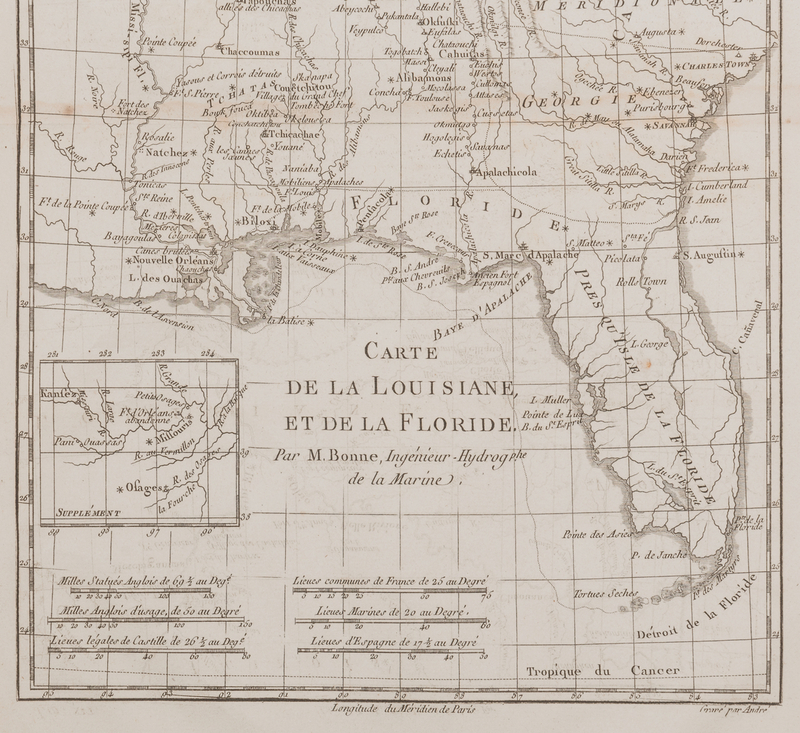 1st item: "Carte de la Louisiane et de Floride", by Rigobert Bonne, engraved by Gaspard Andre, published by J. L. Pellet, Geneva, 1780. 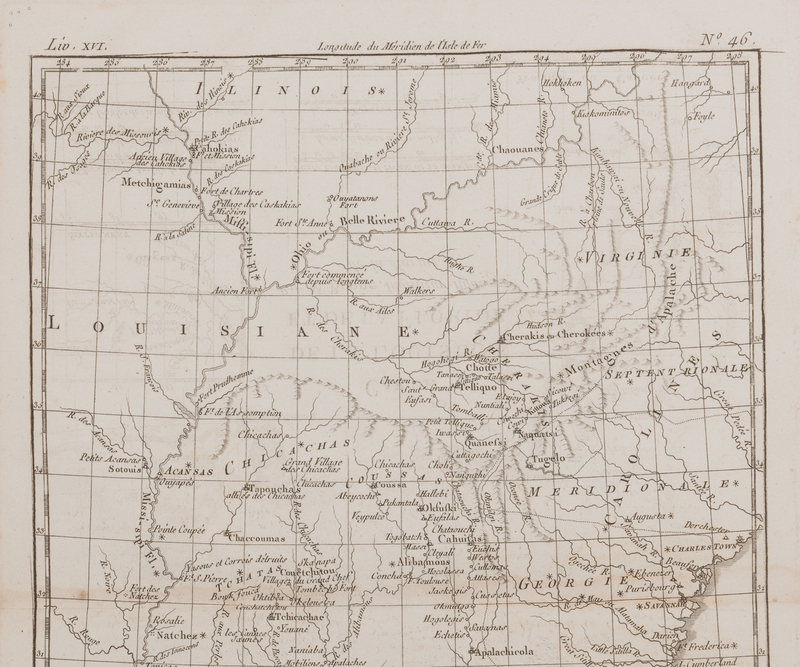 From "Histoire Philosophique et Politique" by Guillaume-Thomas Raynal. 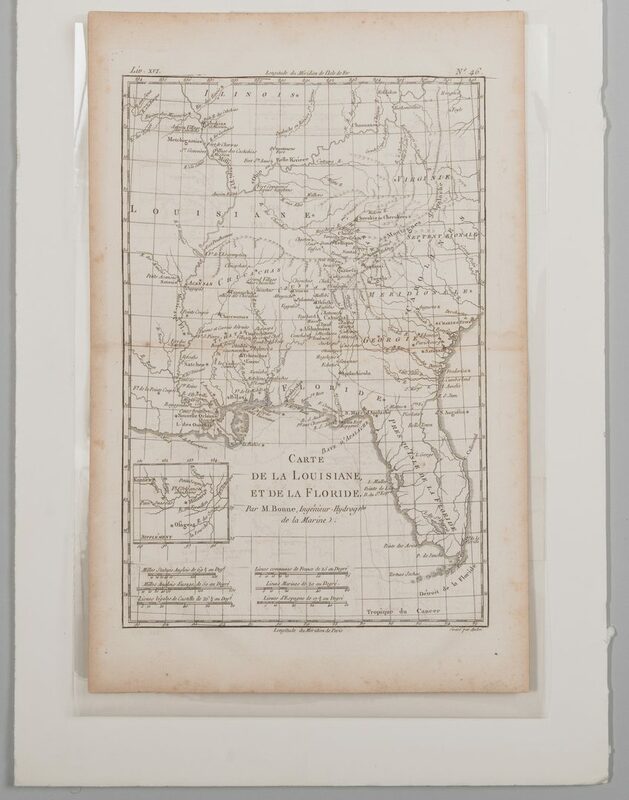 Copper plate engraving of Louisiana, Florida, and the surrounding states depicting cities and towns, roads, rivers, bodies of water, mountains, forts, and notations on the locations of Native Americans. 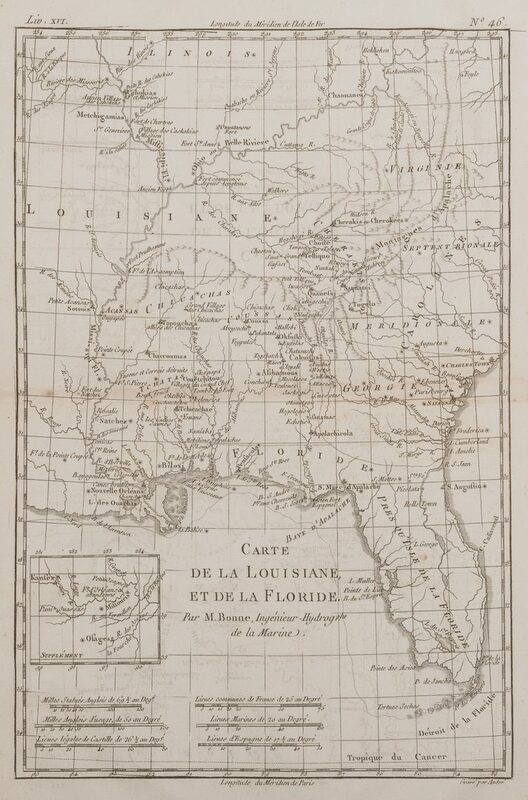 Includes inset map of Fort Orleans and the surrounding area, lower left. 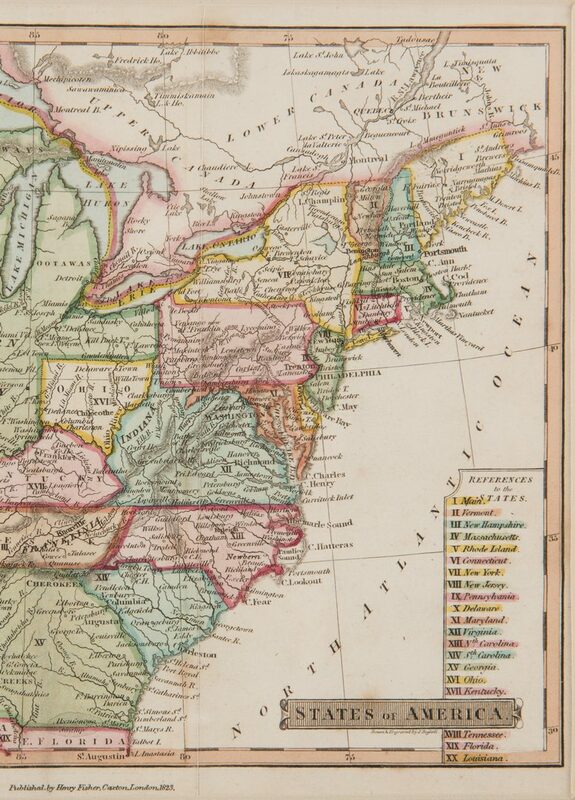 Title, lower center, scales of miles, lower left and center, Tropic of Cancer line, across lower edge of map. 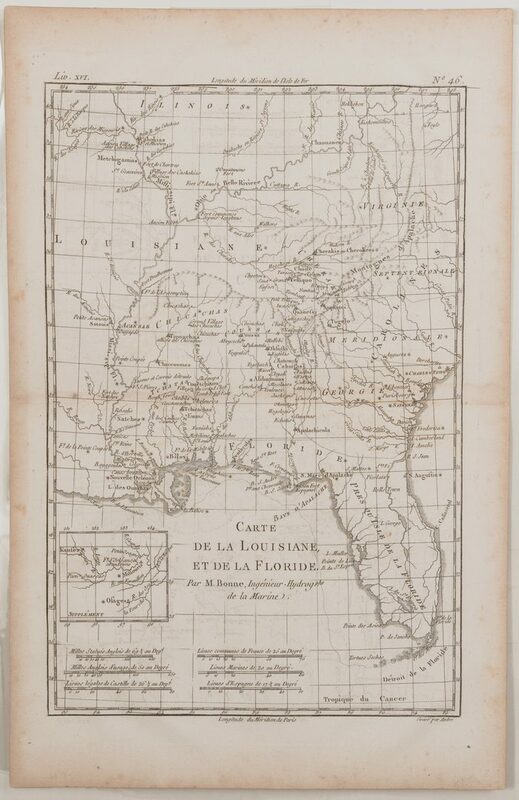 "Longitude du Meridien de l'Isle de Fer", centered above map, "Longitude du Meridien de Paris", centered below map. Map surrounded by scale notations and line border. 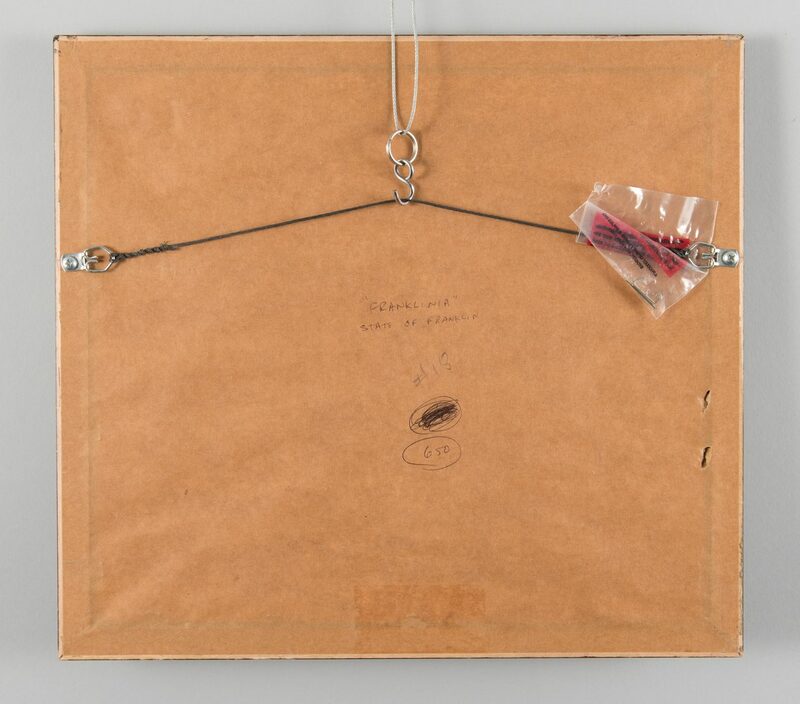 Mounted to board. 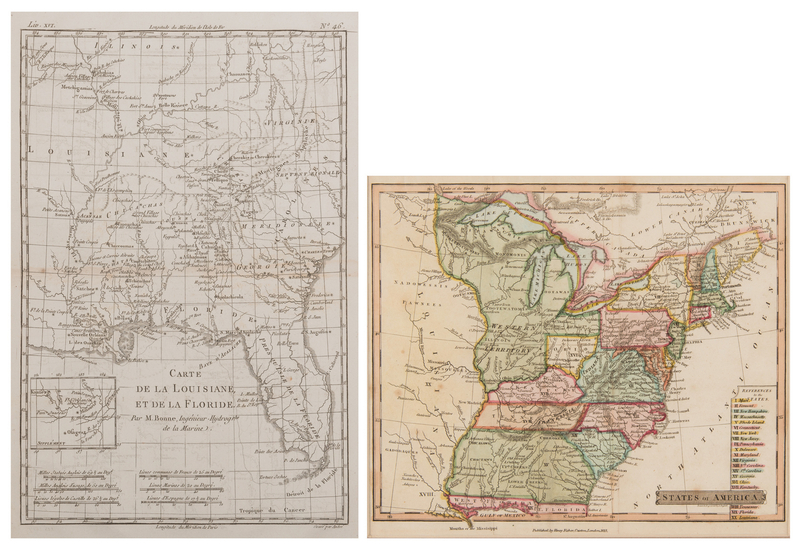 Image – 12 5/8" H x 8 3/8" W. Sheet – 15 1/2" H x 10" W. Board – 20 1/8" H x 13 5/8" W. Late 18th century. 2nd item: "States of America" Map, drawn and engraved by John Russell, published by Henry Fisher, London, 1823. 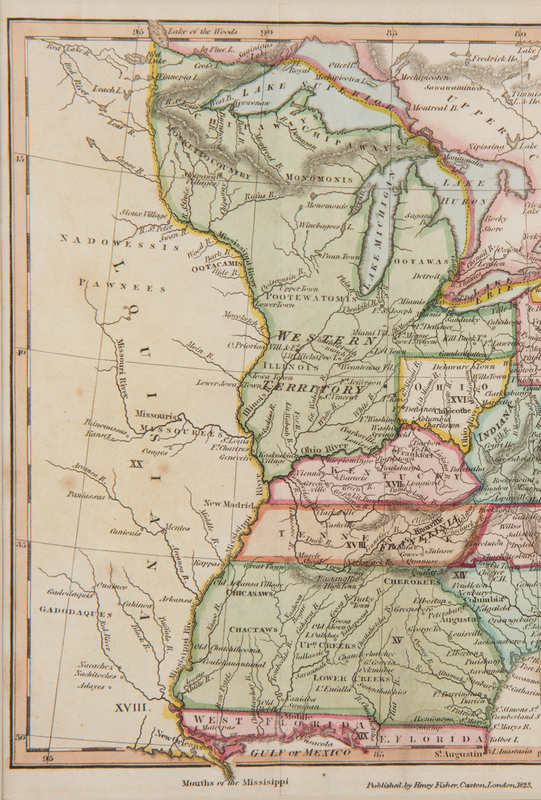 From "A Complete and Universal English Dictionary" by James Barclay. 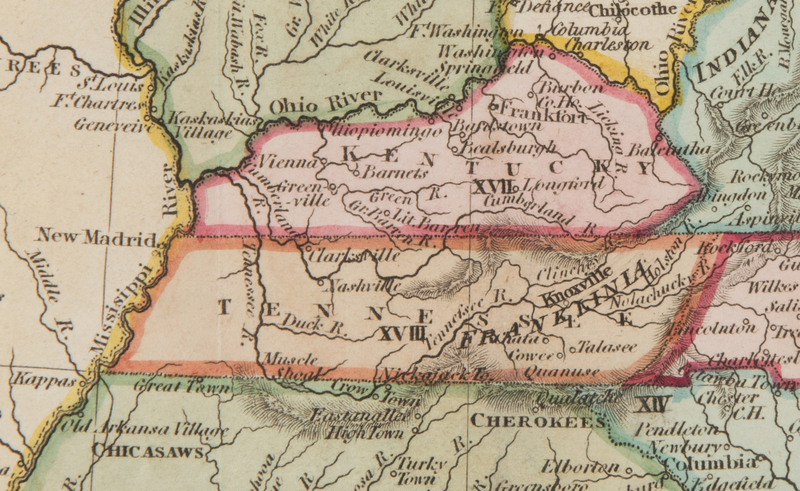 Copper plate engraving with hand coloring of the eastern half of the United States and part of Canada depicting cities and towns, roads, rivers, bodies of water, mountains, and notations on the locations of Native Americans. 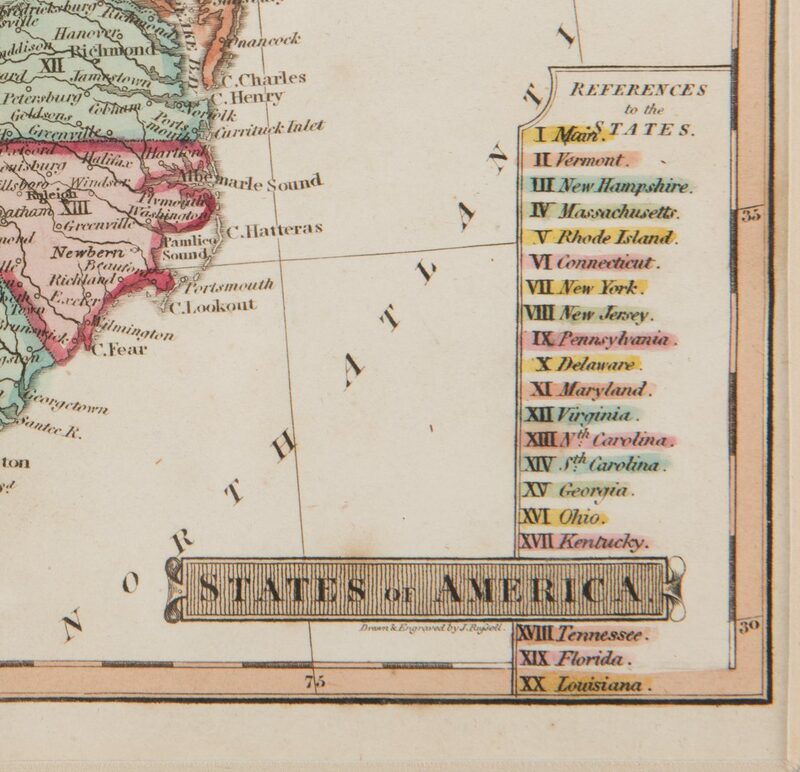 Title and References to the States table, lower left. 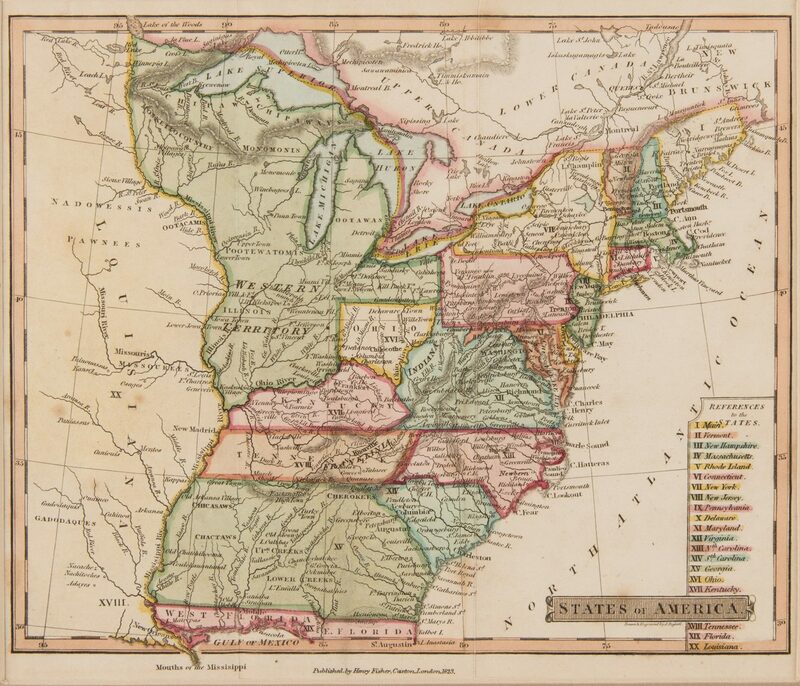 Map surrounded by scale notations and double line border. Housed in a contemporary wooden frame. 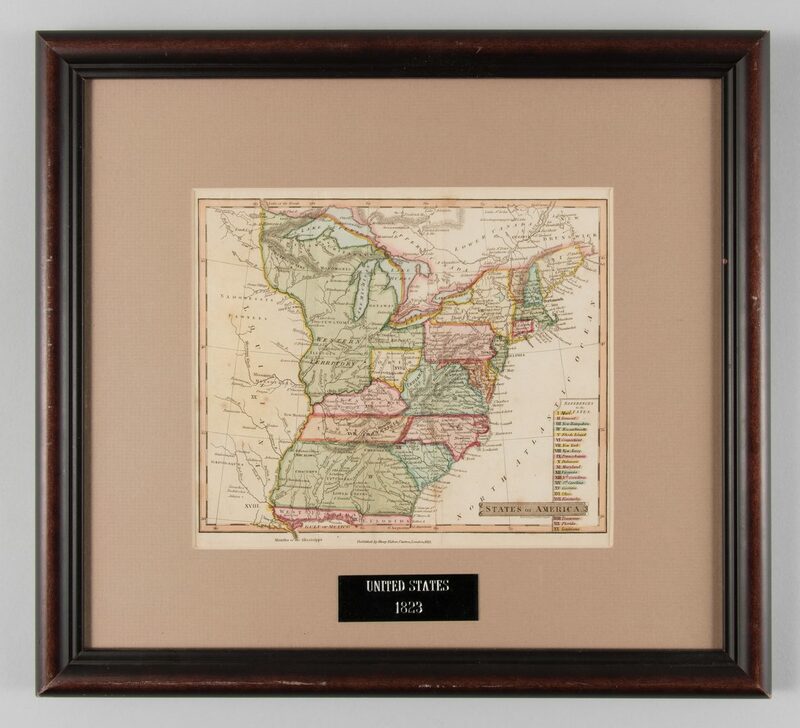 Sight – 7 5/8" H x 8 7/8" W. Framed – 14 1/4" H x 15 5/8" W. Early 19th century. 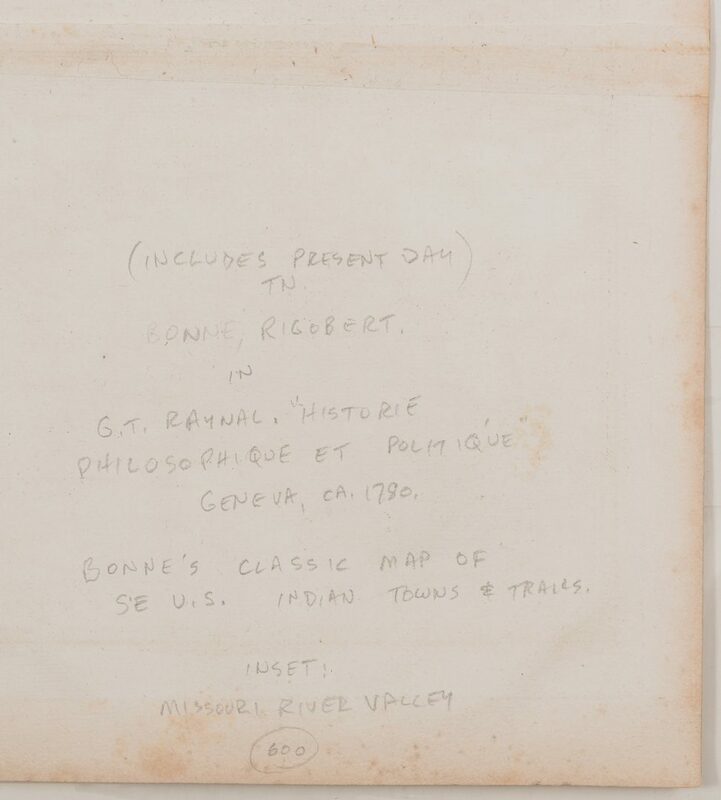 CONDITION: 1st item: Toning impression from map visible on surface of sheet. Toning around edges of sheet. Scattered minute foxing spots. 2nd item: Scattered foxing spots, largest 1 3/4". Not examined out of frame.